Recall the VA’s failure regarding paying our veterans all of the funds they’re due under the GI Bill; those student veterans are being shorted the money they’re owed. That shortchanging will continue next year due to a “software glitch” that the VA isn’t fixing any time soon. Now we get the VA’s Undersecretary of Benefits, Paul Lawrence, saying that the agency has no plans to retroactively pay shortchanged GI Bill recipients or to make next year’s VA victims whole. He didn’t even have the integrity to admit this to the House Committee on Veterans’ Affairs subcommittee before which he was testifying—under oath, mind you, as is typical for witnesses before Congressional hearings—until he’d been pressed on the matter by several Congressmen. And still: the Veterans Administration is not up to the task. Hundreds of thousands of veterans face yearslong delays in their appeals of disability rulings because of a backlog of cases choking the Department of Veterans Affairs…. This backlog causes a number of problems…. Rushed rulings on initial claims can be riddled with errors. Veterans who appeal their cases typically wait between three and seven years for resolutions to their appeals, according to the Government Accountability Office. An inspector general report also found that one in 14 veterans dies while awaiting a decision on their disability claim appeal. The Acting Director of the Veterans Administration is replacing his acting head of Veterans Health Administration with another acting head. The current acting head needs replacement, not through any malfeasance, but because the incumbent acting head is moving to take another position within the VA.
Bad as the VA is, it isn’t helped by this instability in its management team. Not a bit. This continues to illustrate the waste of resources that is the VA. Get rid of it, and use its current and future budgets for vouchers for our veterans. …won’t clean up after itself. In this instance, literally. This is the VA “hospital” room a veteran was placed in when he went to that…facility…for treatment that involved 18 injections. Injections to be done in a room as filthy as this. 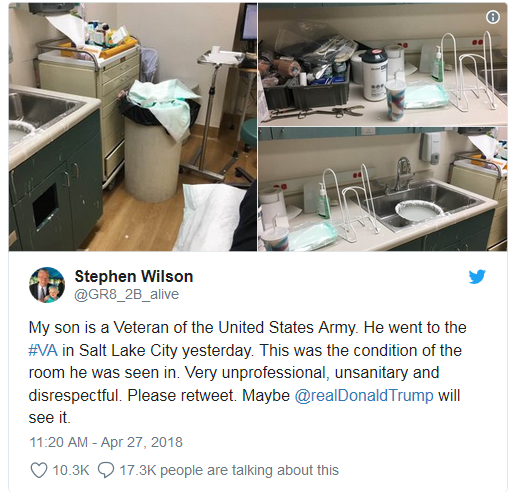 Dr Karen Gribbin, the chief of staff at the George E Wahlen Department of Veteran Affairs Medical Center, on Saturday reportedly said that Wilson should not have been in the room. She said the rooms should be cleaned prior to each patient and called on an investigation. Ex-Veterans Affairs Secretary is making his case that he didn’t resign, he was fired. Shulkin said he had not submitted a resignation letter, or planned to, and was only told of Trump’s decision shortly before the Twitter announcement. Of course, the format of a resignation is immaterial to the act; in particular, letters are the polite, professional way to quit, but they’re not required, not at all. Too, learning that your boss wants you to leave “shortly before the Twitter announcement” might be impolite, even impolitic, but again, learning the boss’ desire is not required for resigning. Nor is desiring one to leave the same as firing that one. Recall that the Veterans Administration’s Inspector General had written a damning report of its investigation into the fraudulent behavior of the VA Secretary and of the Secretary’s Chief of Staff. The IG even had referred the matter to the Justice Department for criminal prosecution. DoJ then declined to prosecute. Now that chief of staff, Vivieca Wright Simpson, has announced her retirement, and the VA has opened its own investigation into her actions, an investigation that might lead to civil action, but it’s not a criminal investigation. I have to ask, then: was this a quid pro quo? Did DoJ agree not to prosecute if Simpson agreed to leave? improperly accepted a gift of Wimbledon tennis tickets…. made false claims to a VA ethics official by altering an email to get official approval for Dr Shulkin’s wife to take part in the trip as an “invitational traveler,” a status that meant the VA would cover her expenses. Her airfare cost taxpayers $4,312. its popularity depleted the allocated funds more quickly than anticipated. Patient visits through the program increased more than 30% in the first quarter of fiscal year 2017, according to the VA.
Based on a sampling of 148 providers at five unidentified VA hospitals who required review, officials had only reported nine health care workers since 2014, and none had been reported to state licensing boards. the VA is required to report providers to a national database designed to prevent them from crossing state lines and endangering other patients. The GAO says in its report on this failure that much of the failure stems from “confusion” about VA responsibilities and reporting requirements. The Veterans Administration is still creating waitlists and secret waitlists, even after all this time of reporting on and calling the VA out for its dishonesty and its disservice to our veterans. Now a Colorado VA facility is—still—doing secret waitlists. Investigators with the VA Office of Inspector General confirmed whistleblower and former VA employee Brian Smother’s claim that staff kept unauthorized lists instead of using the department’s official wait list system. That made it impossible to know if veterans who needed referrals for group therapy and other mental health care were getting timely assistance, according to the report. The internal investigation also criticized record-keeping in PTSD cases at the VA’s facility in Colorado Springs.